There are a number of great fantasy football subscription sites – more than MLB and NBA combined. There are also mediocre and poor sites too (also more than MLB and NBA combined). So why purchase a Razzball subscription for fantasy football? Our philosophy is different than most fantasy football sites. The key value proposition of most in-season fantasy footballsubscription packages is a gaggle of ‘experts’ providing ‘insights’. Maybe they specialize like one guy does ‘injuries’, one guy covers tight ends, another is a ‘DFS pro’, etc. All these writers bloat the cost of the subscription and that type of content is all over the internet for free anyway (including here at Razzball). The #1 reason you should get a premium fantasy football subscription is so someone mathier than you can crunch all the numbers, produce projections that give you an edge versus your competition, and display this data in easy-to-use fantasy football tools so you can make quick, informed decisions. That’s what we do better than anyone in MLB and where we put all our focus on our NFL subscription. So if you want tons of member-only content, subscribe to the other guys. But you should still subscribe to us for the projections! If you sign up for a new FanDuel account and deposit $25 through this link, you can get either a free Roto Deluxe subscription or 2 free month of DFS Premium (an $80 value)! Just e-mail [email protected] once you have completed the steps for your discount code. Click ‘Select’ for screenshots of all the tools included in each package! NFL Roto Deluxe (Season) $14.99 now. NFL DFS Premium (Season) $89.99 now. 1) Our Data Model – It is relatively easy to create weekly NFL rankings/projections with a few formulas in Excel. We have invested significant time in building a data model that strives for excellence in each component of a great NFL projection. It starts with leveraging multiple data sources to determine player roles and estimate snap counts for both the offense and defense that reflect today’s NFL. Yes, there are still a few ‘bell cow’ every-down RBs but there are also RB job shares, 1st/2nd down backs, 3rd down backs, etc. There are every-down WRs as well as WR3s who play a majority of downs and WRs who come out in 4 WR sets. Our model aims to distinguish across all those types and making sure snap counts reflect a team’s offensive philosophy (e.g., some teams are heavy 3-4 WR, some are heavy 2 TE, etc.). Player rate stats (completion rate, yards per carry, etc) are based on previous game stats as well as player scouting grades. Team rush/pass splits are projected based on team and gameday variables (spread, home/away, etc) and carries and targets are distributed based on player role, skill, and team proclivity. Defensive player stats are derived from the same data as the offensive stats. We even built a model to identify a player’s likelihood to score TDs based on both past games and their height/weight. Net-net, we strive for greatness in every aspect of the process and to be ‘smart’ enough to handle breaking changes like redistributing carries when a top running back is ruled out at Sunday 12:48PM EST. 2) Boldness – Projecting NFL is unique from MLB and NBA in many ways but the one similiarity between the three is that a well-conceived data model is better at blocking out bias than an ‘expert’. 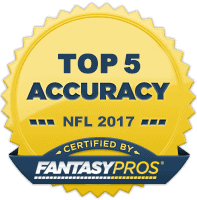 Our model was the ‘furthest from consensus’ ranking systems amongst 100+ FantasyPros experts in 2017 AND finished 5th overall in accuracy. Not only were we the only expert to finish in the top 5% on both accuracy and boldness – no other expert finished in the top 20%! Our model’s accuracy and boldness is better at identifying ‘breakout’ players for a given week. The biggest value in a roto or DFS system isn’t going to be how they project Julio Jones – it is how they are going to project the barely-owned WR who is in line for a big day. That is where we shine and where aggregated projections struggle. 3) Easy to Use Tools – Our fantasy football tools are driven by a powerful data table that allows you to filter multiple columns at once. Find the top WRs for this week that are owned in less than 70% of leagues in seconds. Our 17 Week Player Ranker tool shows a player’s actual or projected rank across all 17 weeks. You can quickly see ‘What if’ projections to see the impact if injured players are ruled out close to kickoff. You can always download into a CSV or Excel. For DFS, we have all this and a top-of-the-line lineup optimizer powered by DailyFantasyCafe for DraftKings, FanDuel, and Yahoo. 4) We Love Fantasy More than Technology – There are some ‘cool’ tools out there like being able to import your lineup. Whoop-de-doo. We aren’t techies. We (okay, just Rudy) are data geeks who go the extra mile on the data side to create tools that help you make more informed decisions. Instead of just projecting week-to-week or providing ‘matchup ratings’ for future weeks, we project all 17 weeks’ worth of games. This powers our 17 Week Player Ranker which shows player rankings across each of the 17 weeks so you can visualize a player’s value across multiple weeks. Our Team Pages are crammed full of tables showing everything from Season to Date and Rest of Season projections to distribution of snap counts, rushes, and targets (for all 17 weeks). Beware sites where technology is their forte – it usually comes at the expense of data quality. 5) Transparency/Accountability – We want your questions and feedback. You can comment on any of the posts or pages or reach our stat guru Rudy Gamble via e-mail ([email protected]) or Twitter (@rudygamble). More questions? Check out our FAQ or select one of the packages below to learn more.